I’m in for 6 sets. Ok, I'll sign up for five sets. Red I have six sets done. As I was putting my sets in gallon bags, they don't quite fit. There's a little over 1/2" thats gets folded over. Here's a picture to show you what I mean. Red I have six sets done. Where do I mail these to? I have been waiting for a swap. I am in for 6 sets. I would prefer the 10 inch square because sometimes I buy the precuts, but 10.5 works for me. I definately have enough yardage. My understanding is anything goes in terms of color, geometric, floral, I spy, etc. Can't wait. I'm not certain if Marietta, Givio, and Dieldorffdaisies are joining or ?? 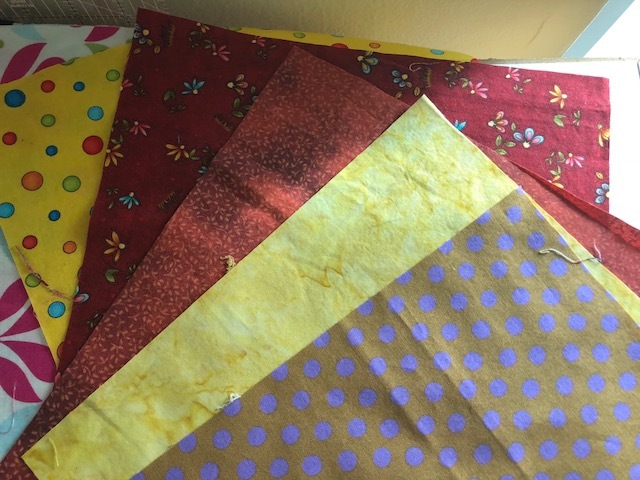 As for the fabric questions: Each baggie needs to have different pattern fabrics in it. If you are swapping more than one Set (i.e. what is all in the baggie) each Set can be the same or different. Does that help? Not quite sure how to respond to the slight foldover in the ziplocks. I wish I could get a hold of the quilter who did this swap years ago and find out what they were doing. Last edited by redstilettos; 02-04-2019 at 09:39 AM. I'm guessing that I didn't send you my information since my name is not on the list, Red. I'm hoping I can still join with six baggies of twelve 10 1/2" squares. If I remember from past swaps, squares were folded over. The squares I found in a baggie were folder over somewhere in the middle (not in half exactly but folded over as a group). Hope that helps . . . Sorry Red, I'm in ...just not sure how many sets yet. What info do I pm to you? Mine are ready to mail. Just need to double-check the address when you get a chance. I'm in! I'll probably do 2 sets. I did this previously and it might be that you need a different brand name baggie. For some reason I think I had to buy the ones with a zipper type closure. Just saw this swap and would like to participate. I haven't done many swaps lately and would like to get back into it. 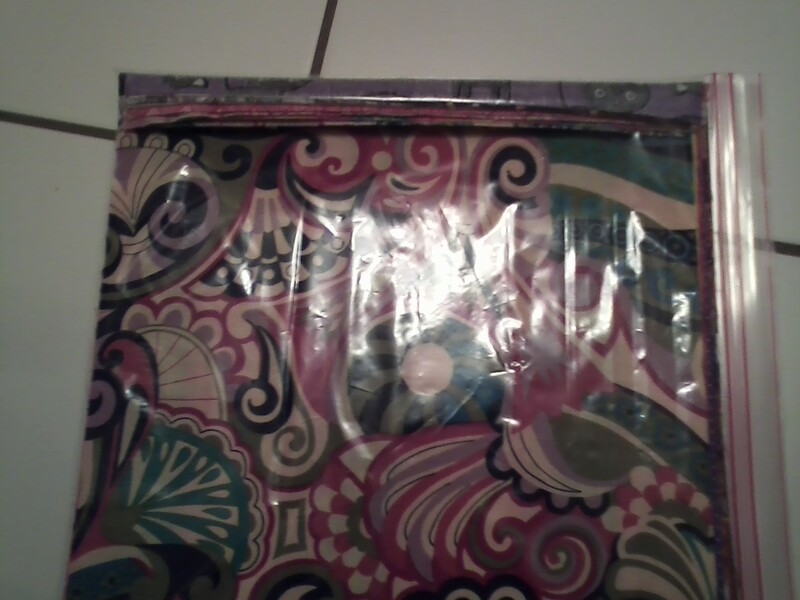 I'm going to go with six sets of 12 different fabrics this time around, so one full envelope. Will pull fabrics and start cutting tomorrow! I signed up to send 6 sets of layer cakes. 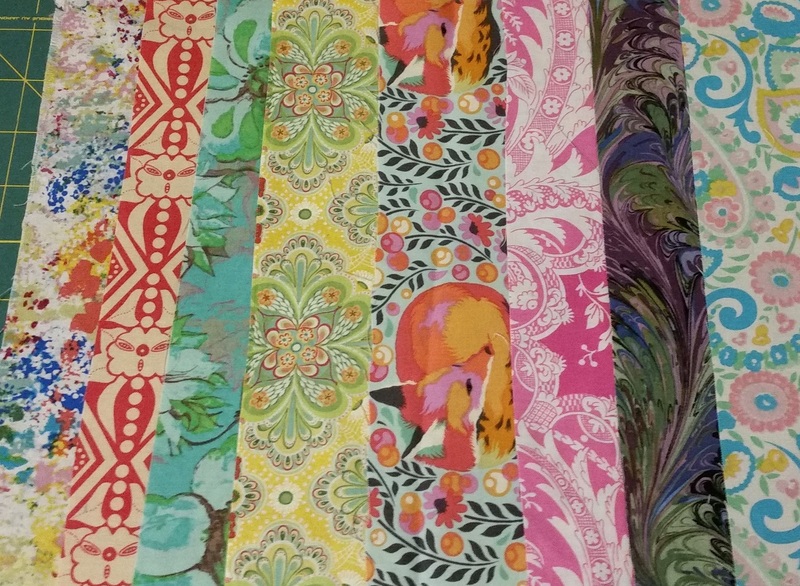 For my 12 fabrics, I decided to cut 11 identical sets of fabric, plus 1 fabric I'm calling a Wild Child. The Wild Child is unique to each set--only one of its kind. Hope you like all 12 coming your way! Do you have a favorite "child" among these pictured? Just curious what your tastes are. Oops! Good thing I took a picture. 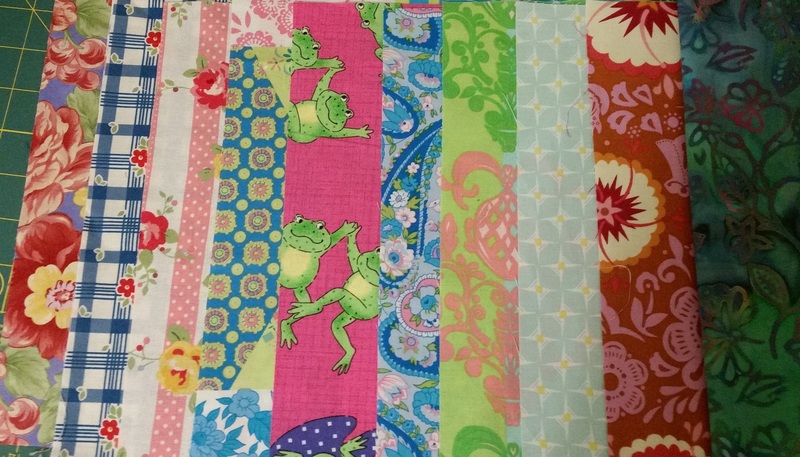 When I counted these "wild child" fabrics on the screen, I realized there were only 5, not 6. Apparently I was absent the day the kindergarten teacher taught counting. Here's a picture featuring the correct number of Wild Child fabrics. Again, I'd love to know which of the 12 is your favorite. 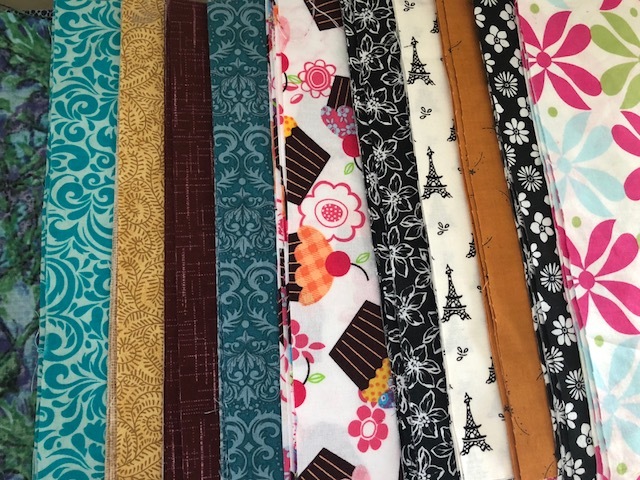 zozee~ fun fabrics! 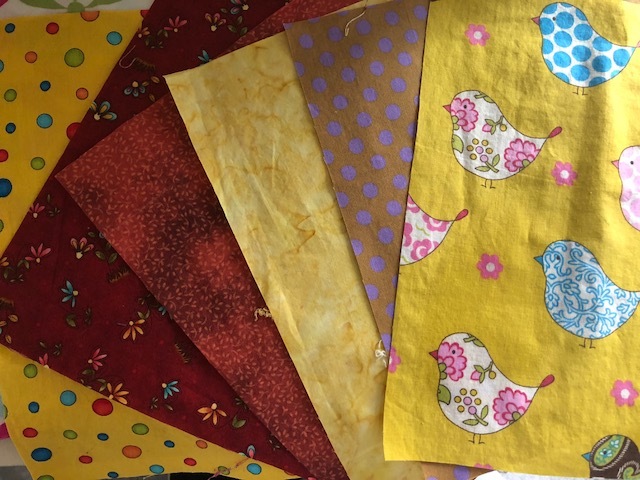 In the wild child fabrics, the yellow with dots, and the birds get my vote. I need to search my stash, and consider playing along here. I like the "wild child" idea but I've already got mine ready to go . . . just have to get to the post office between ice storms and snow and flat tires. How can anybody have 2 flat tires on the same tire in one week? I haven't had a flat tire in years and then twice in two days, the only two days I was able to get out last week. I was also upset to learn that tow truck drivers don't change tires anymore, they just tow to the nearest tire store whether open or not. I'm glad I have my quilting and reading. zozee - love your wild child idea - and the birds in that set are really cute! One day, when I am frayed and strained and drizzle at the end, please someone cut a square and put me in a quilt that I might keep a child comforted. Zozee, love your "wild child" My favorite is the polka dots and the birds. I love birds and have been saving enough for a quilt. We have three bird feeders in the backyard and can watch them from our dining room. My favorite are the cardinals, We have four that visit every year. Two males and two femails. But I am back, my power is back, and now we are off to the fun stuff. Mailing and redistribution of said fun fabrics. I love the chatter that went on here and I'm happy to see the number of people who are participating. I'm going to be pm'ing everyone with my address, so if you don't receive it today, please let me know and I'll make sure to get it to you. Mailed my 4 sets Friday. Here are pics of some that I sent, didn't think about taking pictures of the 4 different sets I sent off. those fabrics are so much fun!